Global Water's WE800 Weather Station data logger is a fully integrated, easy-to-use, economical, computer-based weather station for monitoring and reporting many weather conditions. Global Water's WE800 Weather Station Data Logger offers state-of-the-art technology for continuous data logging, storing and retrieving of weather station information. All weather stations include the GL500 Data Logger, Global Water Data Logger Software, and a RS232 cable (for communication between the logger and your computer). The GL500 Data Logger, the weather station's durable and powerful data logging and recording unit, is enclosed in a sturdy weatherproof case. The weather station data logger will operate for several months before its internal 12VDC battery requires recharging. When used in conjunction with solar panels, the weather station data logger can be powered continuously. The GL500 Data Logger includes a real-time clock that dates and time stamps each record. Weather station data can be accessed easily either through a real-time data screen or through a log of recorded data (programming and calibration are not required). Maximums, minimums, and averages can also be obtained from the data using most spreadsheet programs. All weather station data collected by the weather station data recorder can easily be transferred to a disk file for future analysis and storage. The weather station data can be imported into any standard spreadsheet program. The Weather Station Data Logger includes Global Water Weather Station Data Logger Software, Windows-based software that provies many useful features, such as real-time readout, measurement interval, engineering unit selection, station ID setting, and sensor calibration. The weather station's software makes accessing stored data and setting options easy. Data downloaded from all Weather Stations can easily be opened in any PC spreadsheet program for analysis and graphic presentation. Global Water's Weather Station Data Logger Software will run on a PC-type laptop or desktop computer running Windows 95 or later. To communicate with the Weather Station Data Logger, a computer must be equipped with a standard RS232 serial communication port. Global Water's Weather Stations include full assembly on a sturdy and durable 1" stainless steel tube frame that can be mounted onto a pre-existing base or onto the WE830 Global Water Weather Station Tripod for upright installation. The Weather Station frame is designed for durability and endurance in harsh conditions. The WE770 Solar Shield, a ventilated sun shield with high reflectiveness, low heat retention, and low thermoconductivity, is provided as protection for the Temperature and Humidity sensors. Global Water highly suggests using the solar shield to protect the Temperature and Humidity sensors from direct sunlight. Temperature and Humidity sensors will not read accurately if exposed to direct sunlight. A 12VDC 2A-H rechargeable battery is included with the Global Weather Station Data Logger for use in remote applications. This battery can be used in conjunction with solar panels for reliable continuous use. 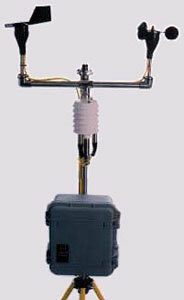 Proper siting for weather station sensors is important to ensure accurate readings. For example, wind sensors should not be installed too close to a building, as turbulence created by the building can interfere with readings. The Solar Radiation sensor should be installed in direct sunlight on a level surface (bubble level and leveling screws are included with purchase). Purchase of both the Wind Direction and Wind Speed sensors includes a T-mounting bar with a 1" stainless steel coupling unit and allen wrench for easy allen set screw instalation. Individual wind sensors or solar radiation sensors include 1" stainless steel elbow couplers and an allen wrench. The Solar Shield (with a stainless steel elbow coupler) can be used for protection and easy installation of the Temperature and Humidity sensors. The Barometric Pressure sensor can be mounted with straps for a variety of applications (including inside a datalogger or to a display for hand-held use). Also includes the GL500 Data Logger, Global Water Weather Station Data Logger Software, and a RS232 cable (for communication between the data logger and your computer). Unless otherwise specified, sensors and the data logger will be mounted to the WE820 Mounting Frame. To add weather sensors and mounting hardware, add the costs below to the WE800's standard cost (above).